This morning I decided to see if there was anything that caught my eye on Amazon in regards to pedal deals. Usually, pretty dangerous for me to do this. I did find something interesting though – the Mad Professor Mighty Red Distortion. Simply, the Mad Professor Mighty Red Distortion is a high-gain distortion with volume, presence and distortion control. It’s going for that 80s compressed distortion – which isn’t for everyone based on that description, but to me, compressed distortion is great for sustained leads! I have always appreciated Mad Professor products – I think this might be a winner! MRD is a high-gain distortion pedal, which was modeled after the 80’s style compressed gain sounds. It is extremely easy (and lot of fun) to play, because its texture is adjusted to give clarity and definition also at heavy distortion. Gain range allows also low distortion sounds as well as stacking with other pedals, where an overdrive (preferably MP LGW) can pre-drive MRD for extreme and highly focused sounds. To get these gain levels with their impressive signal to noise ratio, we didn’t use any noise gate or expander. Instead, we used special amplifier techniques and extreme low noise amplifier stages, which result in a natural decay and a rather high current consumption for a distortion pedal in view of battery operation. 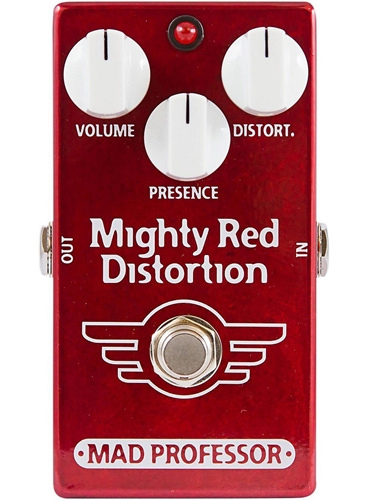 The Mad Professor Mighty Red Distortion typically sells in the $160 range, but on Amazon right now, it’s available for only $82.12 and includes FREE shipping. Basically.. half off! If you own this pedal, please let us know what you think by commenting below!